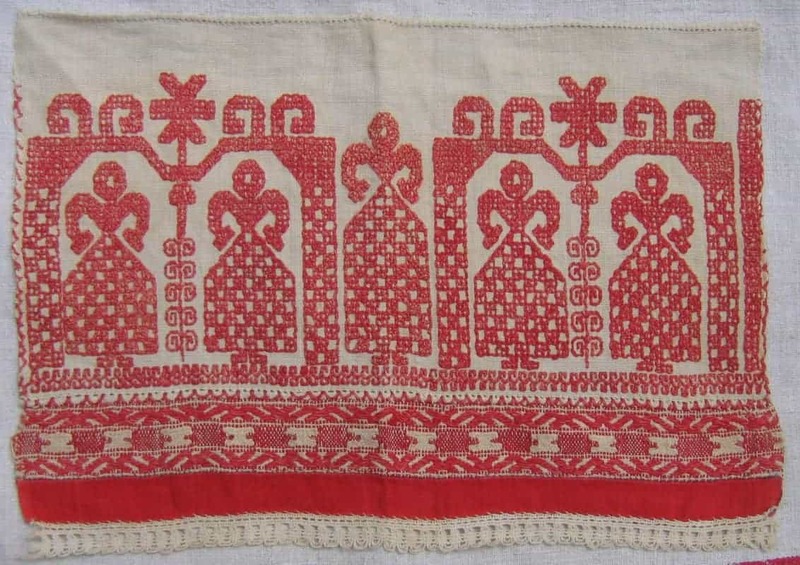 This piece is one of the first Russian textiles I acquired and has been the most useful in my teaching and talks. 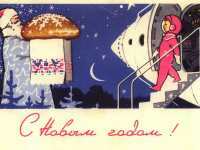 It’s a great example of a Russian towel (polotense / полотенце) – or at least just the end of one. As with so many textiles in museum and private collections, someone long ago took the decision to cut off and keep only the decorative bit. The ceremonial towel is found all over eastern Europe and in Finland and Estonia. 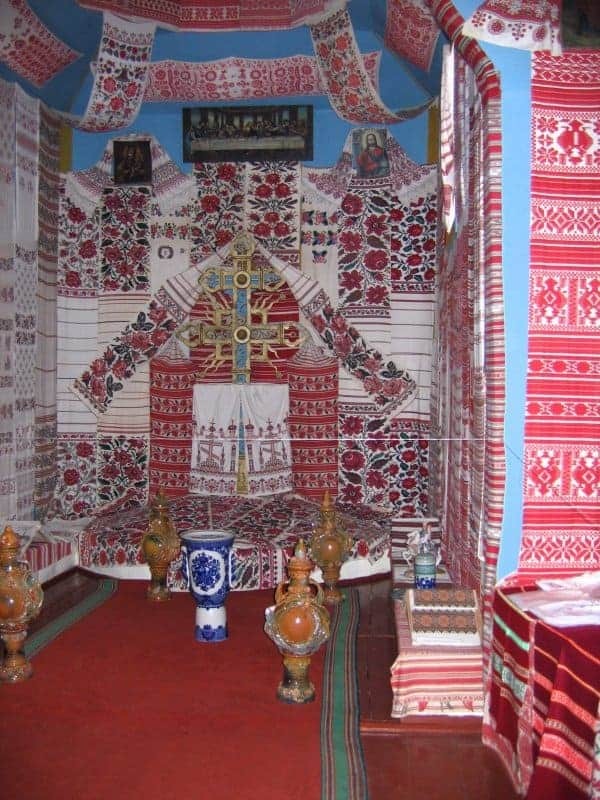 In the open-air museum preserve in Pereyaslav-Khmelnitsky, near Kyiv, Ukraine, is a church entirely filled with a display of towels (called rushnyky / рушники in Ukraine). 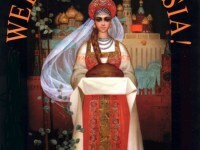 They can still be seen adorning churches all over Russia and Ukraine, and as part of wedding ceremonies. 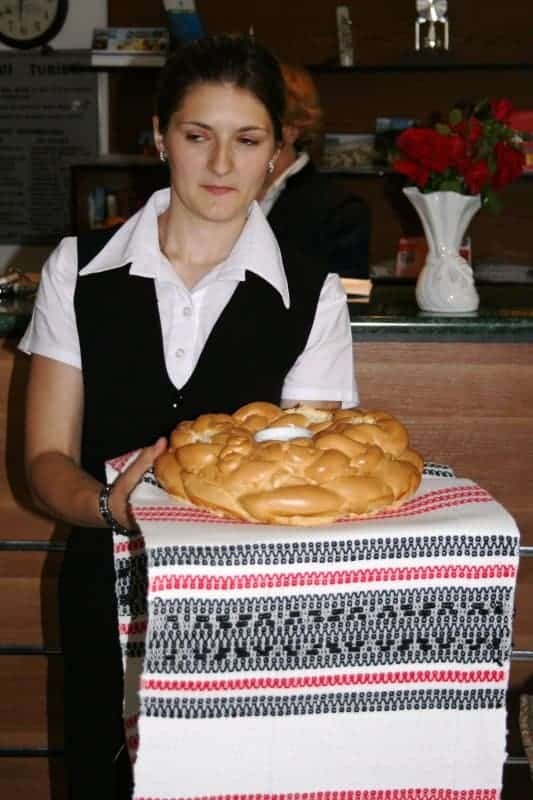 We were greeted with the traditional welcome of bread and salt displayed on a ceremonial towel in Piatr-Neamt, Romania. This article, explaining the functions and meanings of such towels, first appeared in the November/December 2008 issue of ‘Embroidery‘ magazine. 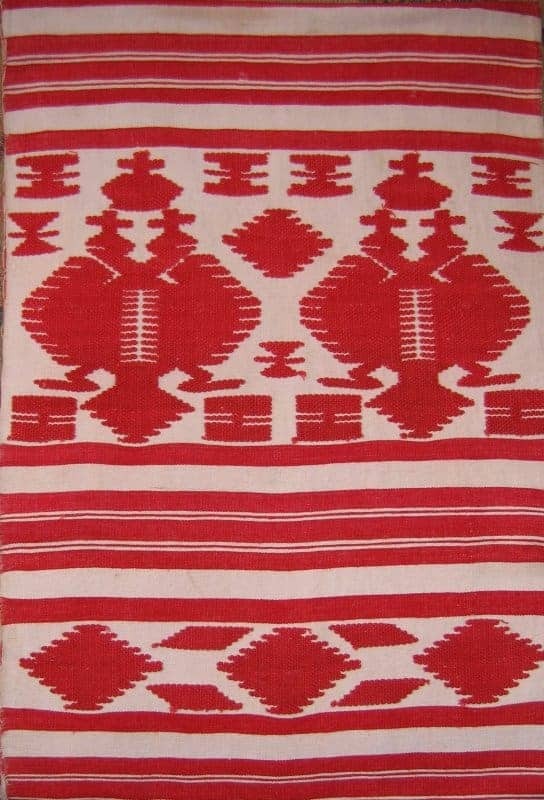 For hundreds of years throughout European Russia, Belarus and Ukraine a particular type of textile played a key role at every stage in the life of traditional rural communities – a way of life governed by superstition and ritual.This object is usually described as a ‘towel’ (polotentse in Russian, ruchnik in Belarusian, rushnyk in Ukrainian) but its functions and the meanings it embodies run far deeper than that rather ordinary name might suggest. Usually made of linen woven in the home, these towels were made in a multiplicity of lengths, according to their intended use, and were embellished either with designs incorporated into the weave or with embroidery. 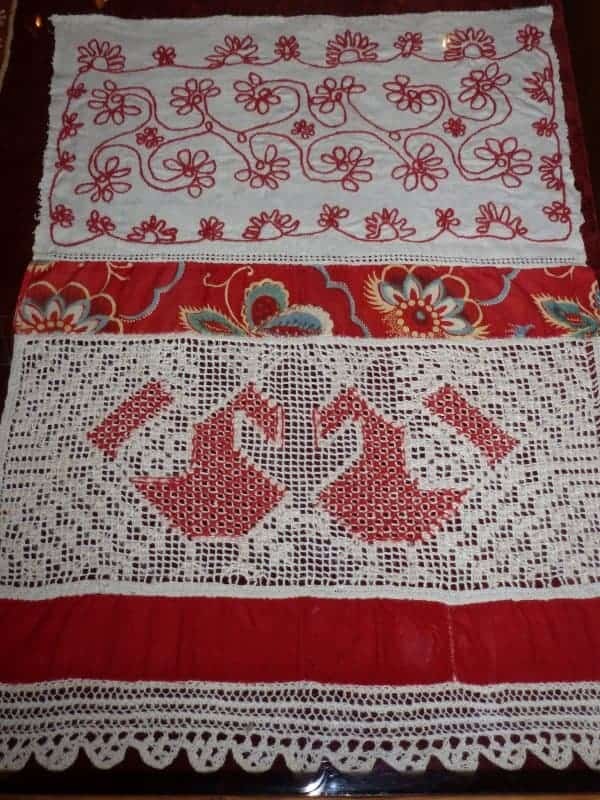 Russian towels usually had embroidered designs worked on each end, with the middle section of the towel left undecorated, whereas those from Ukraine were often embroidered along the whole length. 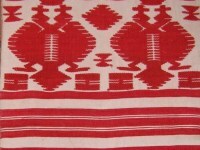 There was also a strong tradition in Ukraine and Belarus of woven designs. The towel ends were typically trimmed with red ribbon or calico strips and bobbin lace or crochet in white cotton or unbleached linen thread. 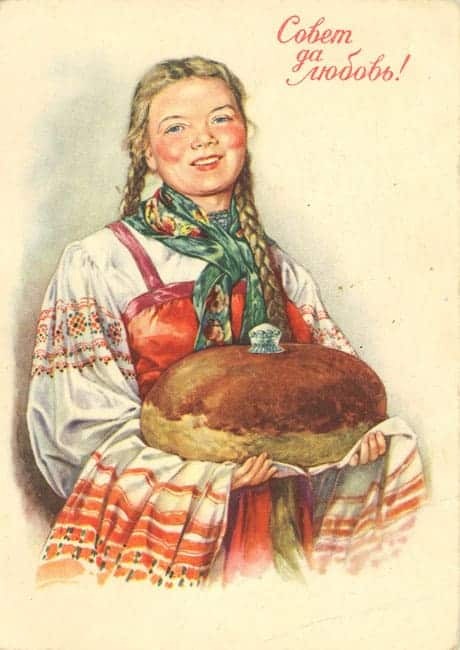 A peasant girl started around the age of five to make threads from flax. By fourteen she would know how to make all elements of dress for herself and would have made and embroidered many towels to be put away in her dowry chest. Records show that girls from wealthy peasant families might accumulate well over a hundred towels. 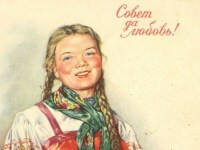 In folktales, songs and proverbs embroidery is often mentioned as an essential occupation for girls before marriage. A skilled embroiderer was considered an ideal bride and could expect many approaches from matchmakers. The most highly decorated towels were given by a bride to her new relatives and honoured guests at the wedding. Towels were worn as belts by both bride and groom, who also stood on a towel – symbolic of the path to a new stage of life – and had one wrapped around their joined hands. Towels would be draped over trees to placate forest spirits, over the backs of sledges to protect travellers, on grave crosses to ease the way into the next world, and invariably, in the sacred space of the house, known as the ‘beautiful’ – or ‘red’ – corner, connected in pagan times with the cult of ancestors. 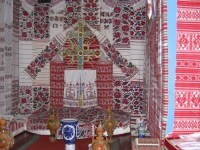 After the coming of Christianity, the family’s precious icon was hung in this space, draped with a towel. From 1917, in the newly-formed USSR, this became the ‘Lenin corner’, and while the icons officially disappeared, the towels remained, now hung over a portrait of Lenin. These days towels can again be seen in abundance, over every sacred object in thriving churches, and adorning portraits of national heroes such as Ukrainian poet and artist Taras Shevchenko. In peasant life, after use at weddings and funerals towels would be given to the helpers or to the church. Church elders would hold bazaars to sell them, allowing poor or orphaned girls who did not have the means to make their own a chance to acquire some for their dowries. The older the towel, the more it was prized. If it had been involved in many significant ‘life events’ it gathered to itself increasing protective and fortune-giving properties. The form and colour of its decoration were essential elements of the power of the towel. 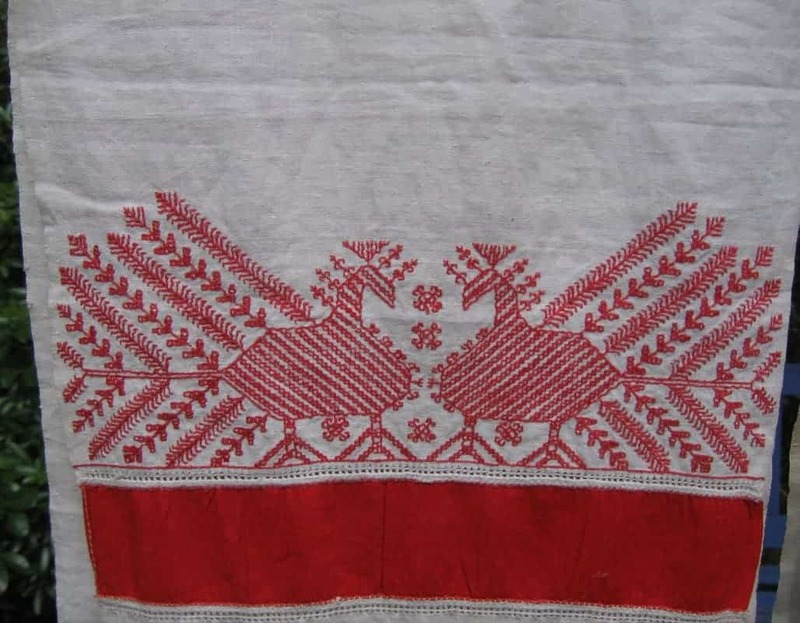 Certain motifs and stitches occur again and again, and the embroidery is almost always done in red – a colour of huge significance to all the Slav peoples, being associated with both blood and fire as life- and fertility-giving principles. In ancient times the construction of cloth and the embroidering of form-building stitches were in themselves regarded as sacred acts, involving many rituals. The creation of a new structure by means of stitching into the cloth was done so skilfully that the embroidery on the back of old towels is indistinguishable from that on the front. Linen being the fabric most commonly used in northern Europe, it is natural that the embroidery techniques typical of this area are of the counted-thread variety. The even weave of linen lends itself to stitching over the grid of threads to create geometric forms, and also to the withdrawing or pulling together of threads for various types of lacy drawn- and pulled-thread work. 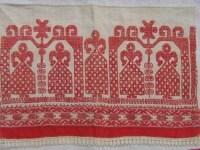 Many towels have panels of Russian drawn ground, where the motif is left in the linen while threads from the background are withdrawn, leaving a grid which is then strengthened and decorated by overcast stitches. The most common stitch found on Russian towels, allowing for the creation of perfect double-sided motifs is the double running (or Holbein) stitch. Ukrainian towels also feature free embroidery to create bold flowers and plant forms. 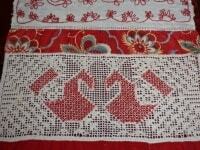 Cross stitch came into use in the twentieth century and is now widely used. The motifs on Russian towels tend to be geometric and stylized, with the choice of design varying according to the occasion for their use. Those embroidered to mark important events of the agricultural year, such as the first day of hay-making or harvest, would include symbols invoking fertility for the land – female figures referring to the goddess sometimes known as ‘Mother Moist Earth’, who would be carried in boats or on horses representing the sun travelling across the sky, and Tree of Life forms. Horned figures and animals are also associated with fertility. 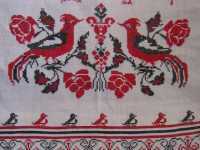 Bird motifs often occur, particularly on towels connected with rites to welcome the Spring. 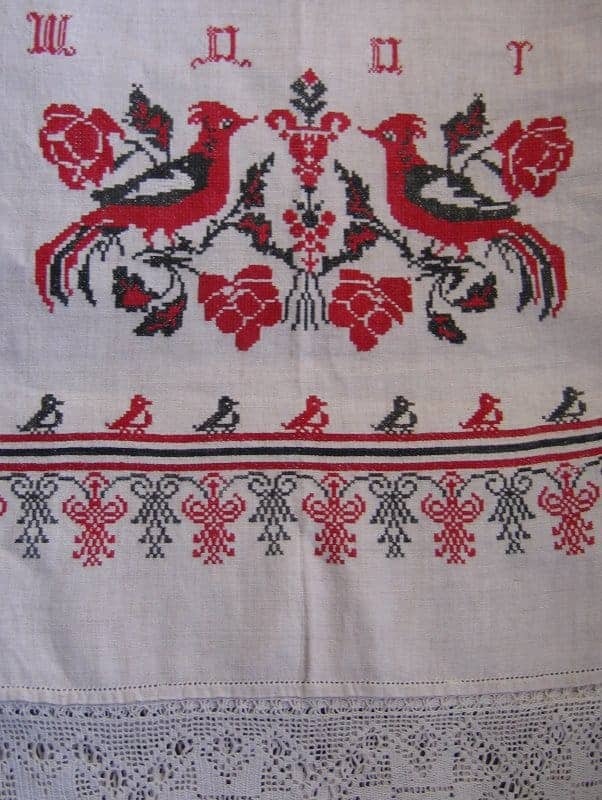 Embroidery on twentieth-century Ukrainian towels features more figurative designs of birds, flowers or grapes on the vine, and may include the date of working and initials. 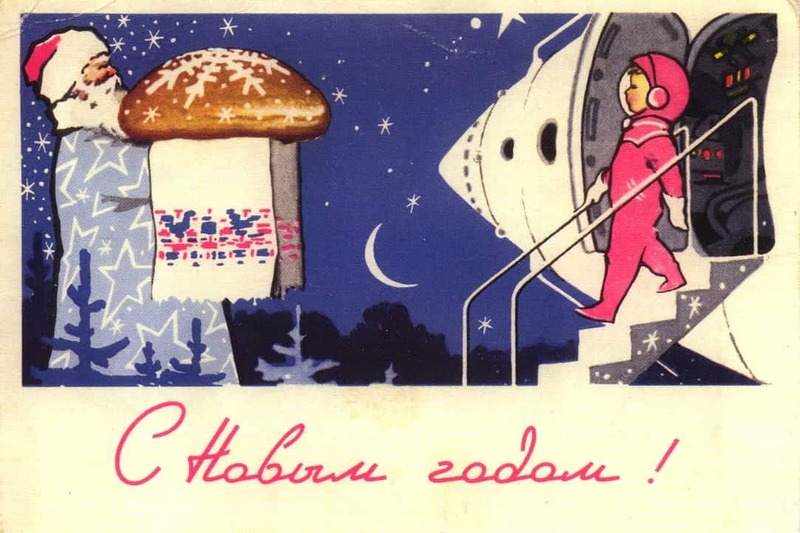 Wedding towels often show seven small birds as a coded wish for the couple – the words for ‘seven’ and ‘family’ being very similar in the Slav languages. 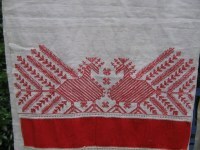 Belarusian towels favour flowers and geometric patterns in counted thread stitching, often using blue or black thread alongside the prominent red and white colour scheme. An age-old use of these ritual textiles was for the presentation of bread and salt laid on a towel, as a gesture of welcome to guests. 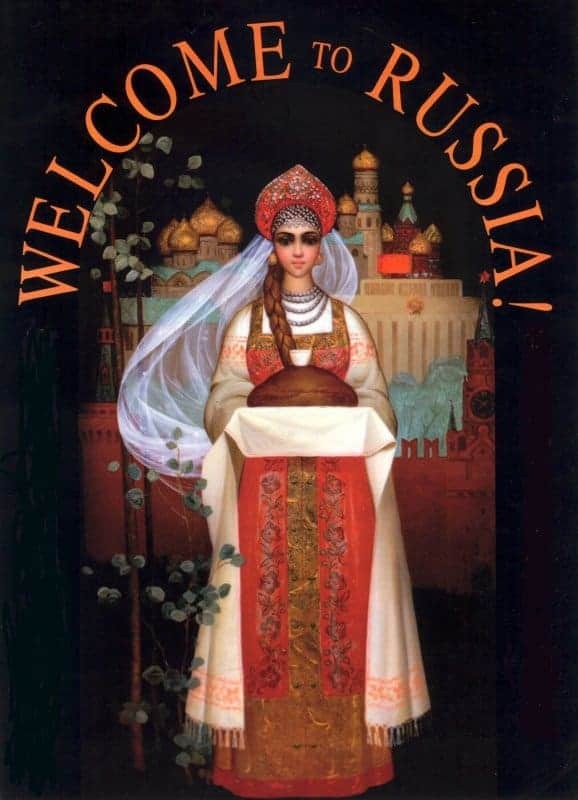 The image of a girl in national dress performing this ritual can still be seen in tourist literature, at folklore events and even on the tarmac of Moscow airport when visiting heads of state arrive in Russia.